My-Bar is an ad-supported program that allegedly gives you the ability to customized and decorate your own homepage, new tab, and search. It works on new tab window of Google Chrome. Aside from providing unwanted new tab, My-Bar also controls your default search engine and assigns an unknown one. Instead of your chosen search tool, you may see unknown homepage, start-up, and new tab window. Most adware programs are hijacking browser settings that cause redirection to various unsolicited web sites. Soon enough, you may obtain virus or malware hosted on dubious sites due to regular browser redirection. Thus, it is highly advice to get rid of My-Bar and all of its components and related applications. My-Bar is normally bundled with certain apps and shareware that can be acquired from questionable web sites. Downloading these apps can be the root of potentially unwanted program infection. Even worthy program did not escape the deceitful scheme of malware authors. They are repacking useful programs with My-Bar so that this adware can spread quickly over the internet. To ensure that you are obtaining clean copy of software, download only from reputable or official web sites. When My-Bar adware is bothering your internet activities or if you are seeing excessive advertisements and redirect issues, it implies that adware is present on the computer. In these cases, immediately scan the system with efficient anti-virus and anti-malware tools. Complete guide to get rid of My-Bar from Google Chrome browser and PC as well is outlined below. 3. Look for and remove My-Bar or Victory Commerce entry. If not present, look for any suspicious labels that was installed recently. 4. It searches for presence of harmful programs, plug-ins, add-ons, or any data that were found malicious and linked to My-Bar. You need to Clean all items detected by this tool. After the previous scans, you may have deleted My-Bar from the affected browser. This next step will ensure that no more module of adware will be left on the browser. This free tool scans and checks the browser for unwanted add-on and extension, and if found, Avast Browser Cleanup will give you a report and suggestion. 4. Avast Browser Cleanup will confirm before it permanently deletes the add-on. Please click Yes to proceed with the removal of My-Bar on the affected browser. Cleaning your internet browser from clutter and unwanted add-on/extension is a must when dealing with My-Bar. The procedure below discuss on resetting various browsers to its default state. 3. On Extensions window, please delete My-Bar by clicking on Remove or Trash icon. 4. Go to Settings window (chrome://settings). Under On Startup area, click Disable extension if My-Bar is present. Resetting Google Chrome to default settings is helpful in deleting hard-to-remove extension such as from My-Bar. This method is highly advisable to perform if you have difficulty in removing unwanted extension. This function will reset your home page, new tab page, search engine, and other areas affected by My-Bar. Unwanted extensions will also be removed from the browser. This will not affect your bookmarks, history, and other saved data. You may also run Chrome Cleanup function from this page. 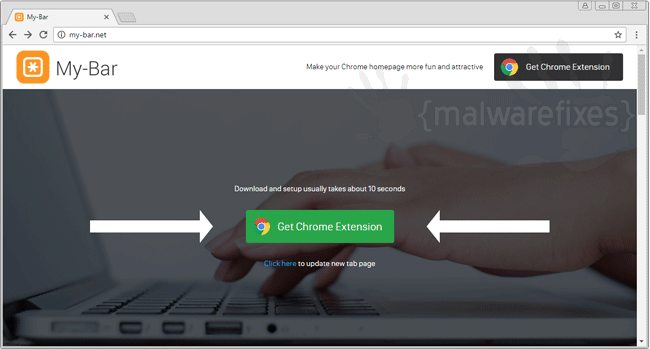 An integrated tool from Google Chrome but with more advanced Adware scanner feature.